Early morning, the Land Rovers had arrived to our hotel and a couple of porters were loading them up with the luggage. Lined up and ready to go we climbed into the jeeps and started the drive towards Kili, a drive that would take a couple of hours. After a pretty uneventful drive the massive volcano started to tower up in front of us and the climb upwards our starting point began. First of all we had to stop by a camp where they weighed all the gear to make sure the porters didn’t carry more than 25 kilos. It was mid-morning and the camp were already packed with other expeditions waiting in line. But it didn’t take all too long before we could jump into the jeeps again and continue the climb up to Londorossi Gate at 2650 m where we would head out from on the Lemosho route. Once we had arrived the porters started to set up tables so we could have lunch before the long walk upwards started. With a full stomach and lots of enthusiasm we put on our day packs and started to walk up the surprisingly well made path leading up in the rainforest. It felt great to finally be on our way, spirit was high. 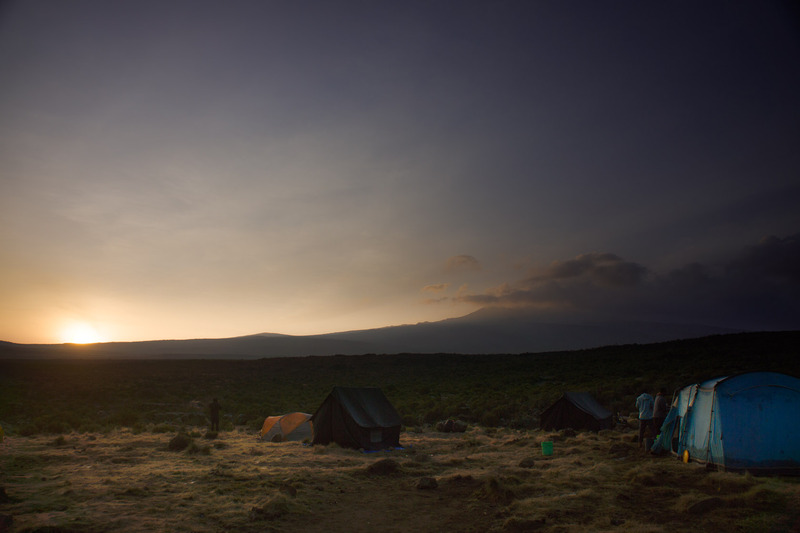 The adventure of climbing Kilimanjaro had begun and the mountain would be our home for the next 7 days. It didn’t take all to many hours before we were at the first camp. We had seen Colobus Monkeys on the way along the path, to our enjoyment there were a couple of them swinging in the tree tops near the camp as well. There weren’t much wild life during our trek (at least that we saw) other than the monkeys. Buffalo can roam the upper plateaus at times but it was nothing that we saw. Other than a carcase of a buffalo near the last camp, it had got stuck in a crevasse that it had climbed into to to lick the salt of the rock. But anyway, we settled in at the camp and it was soon time for dinner, and ginger tea… Oh ginger tea, people still grimace when you mention it. Apparently ginger tea has a good effect on combating altitude sickness, so it was almost the only thing we drank other than water. Well, you get sick of it quite fast. Camp started to get dark and the sleeping bag was waiting. The next morning the porters woke us early with tea at the tent. The air was a little bit chilly but there was no problem getting out of the sleeping bag, we didn’t get that problem until higher up on the mountain. After breakfast the trek continued through the rainforest until we got up on a ridge and the altitude made us leave it behind for much lower vegetation. The altitude had started to reach above 3000 m. With the sun shining and the path crawling like a serpent in front of us down a valley and up another ridge it was time for a break. So far so good. Continuing even further up on the ridges and after several hours of walking, the first glimpses of the majestic peak showed up (top photo). 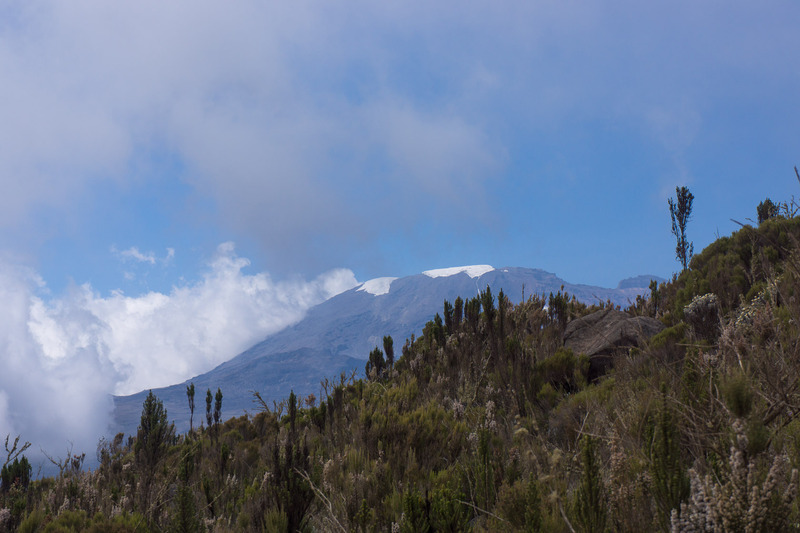 Covered in snow and clouds, the dormant volcano’s top and the goal for the trek was closer than ever. So was the camp site for day 2, not far behind the ridge that the top photo was taken on, down on the Shira plateau. A big camp sprawled out before us when we approached, but at least it wasn’t cramped like the camp the previous night. This was also the camp where the first couple of people started to notice that the air was thinner. Well above the altitude where you start to notice it, the first signs of altitude sickness started to show after dinner for some in the group. But the symptoms went away partly and the sleeping bag was calling once again. Crawling out of the tent the following morning, the sun was about to rise just behind the big ridge that led up towards the mountain top. A spectacular sunrise and a good beginning of an awful day. With breakfast done, the long walk over the plateau started. 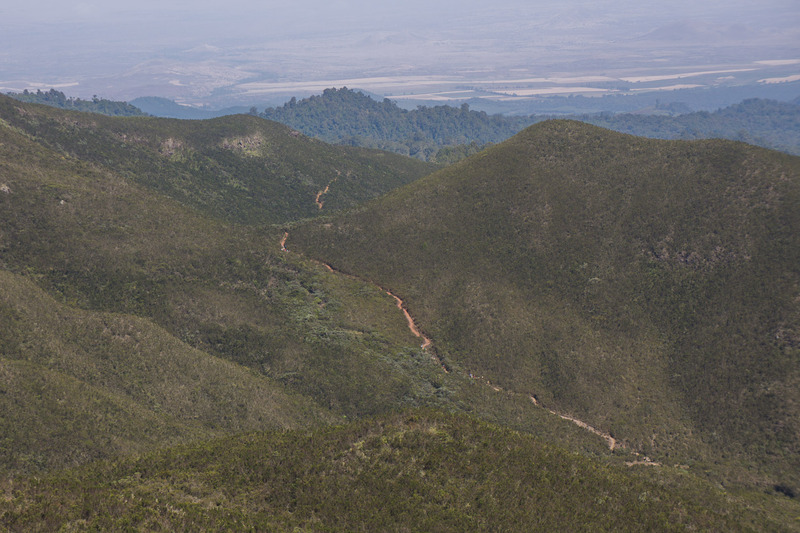 The path was flat until the end of the walk where we started to gain the 500 m of altitude up to camp 3. Half way through the climb I took my daily malaria medicine, 30 minutes later hell broke loose. I started to feel weak and a headache was coming along just fine. Then the nausea set in and it felt like I had a full blown hangover. At this point we could see camp 3, but it felt like miles away. The altitude was now around 4000 m and altitude sickness was a threat to all of us, but for now it was mainly me and another one that it had hit like a sledgehammer. While the rest of the group went for an acclimatization walk, we lay in our tents trying to drink some water with fluid replacement. The agony subsided a bit right before dinner, enough at least so I could leave the tent and stand up. Couldn’t eat all to much though, but some food is better than none at least. As the head still spun after the food, it was straight to bed. From sleeping pretty good the previous nights, the night that followed wasn’t as pleasant. I twisted and turned throughout the night, and the nausea became quite bad at times. Late at night I finally got some shuteye and the few hours of sleep performed a miracle. Can’t say I felt totally fine in the morning but good enough to eat some breakfast and feeling ready to take on the second toughest day during the whole trek. 12km walk over ridge after ridge after ridge. It felt like it would never end. After camp 3 we split from other groups that walked the Lemosho route, Team Kilimanjaro had made their own route that moves north of Kilimanjaro’s summit cone. Making the final ascent from the camp called School Hut, joining up with the Rongai and Marangu routes on the night of the ascent. That day became soul-sucking and we didn’t arrive at camp 4 until late afternoon. It was even more tedious for the two that we left behind around noon due to various reasons, they didn’t arrive into camp until after dark a couple of hours later when the rest of us was about to hit the sack. There and then one in the group abandoned the hopes of making it to the top and the dream of climbing Kilimanjaro. Tagged kilimanjaro, mountaineering, tanzania, travel.